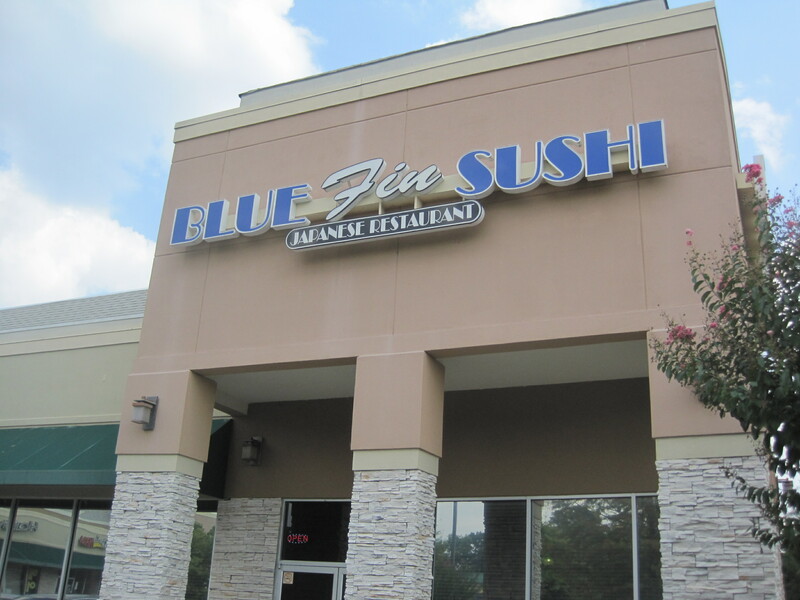 Blue Fin is the reincarnation of Sakana Ya, moved north along Peachtree Industrial from the Tilly Mill intersection to a location above Duluth Highway. 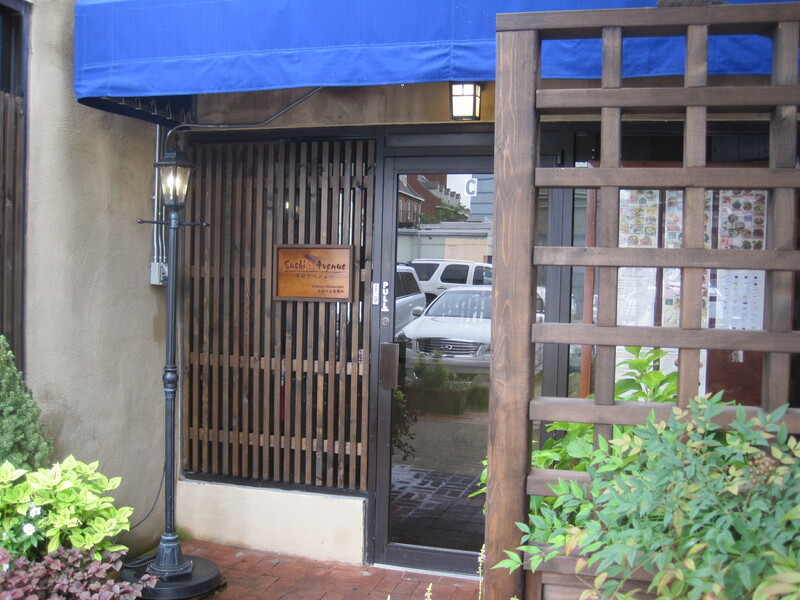 It’s pretty enough inside to take a date, serves nice large bowls of food, has quite a few Japanese clientele. This is more likely what you’ll see when approaching Blue Fin. I would describe the menu as smaller, but reasonably diverse. We came at lunch, so really have no feel for the dinner menu. There is a long sushi bar on one side, and a scattering of tables throughout the space. If I had to guess at capacity, it looks as if it could handle 50-75 diners. Although it’s not postage stamp tiny, it’s not a huge place. 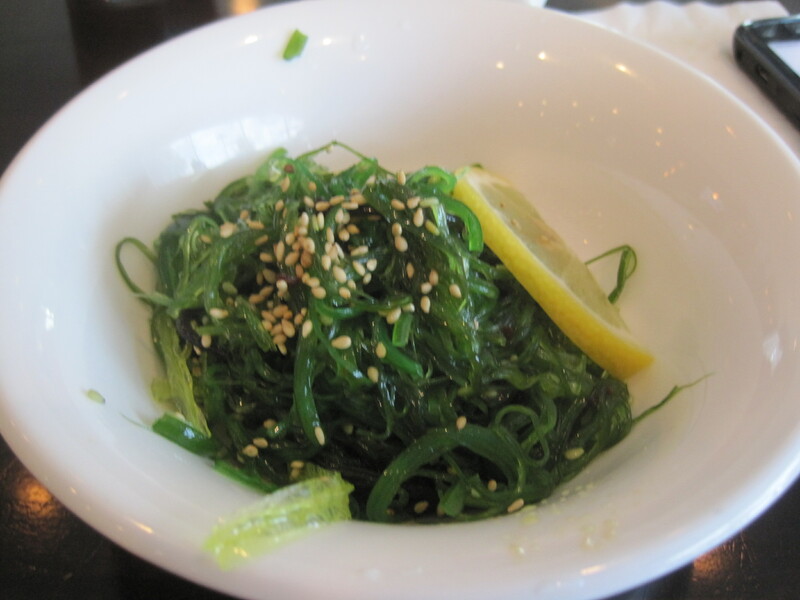 Outside of sushi, there were tempura and donburi offerings, ramen and noodles of various kinds, edamame, tonkatsu, the seaweed salad I ordered, as well as tuna tataki. 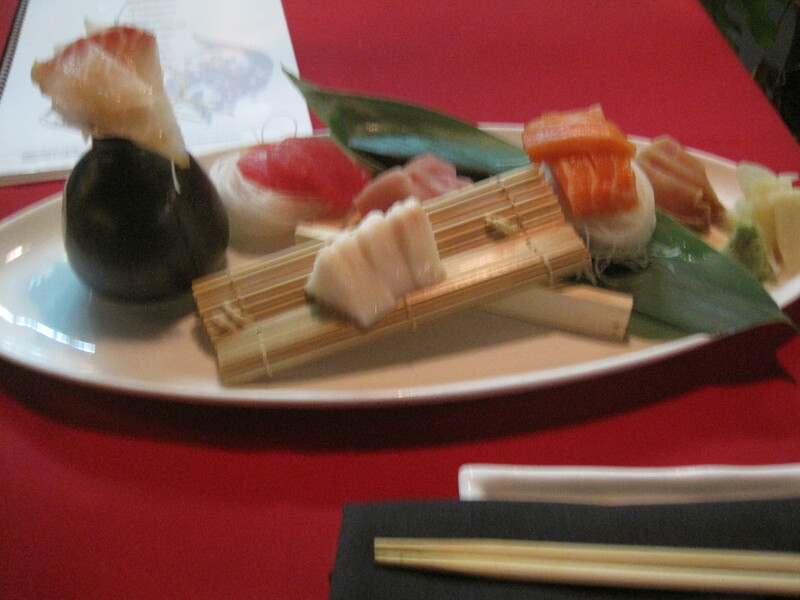 Sushi selections were not limited to nigiri and rolls. 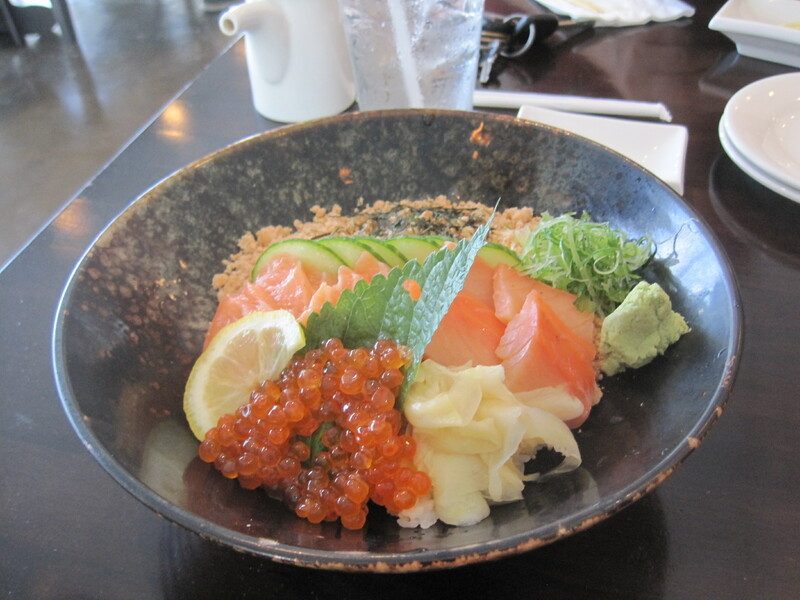 They had a good looking chirashi zushi on the menu, and the salmon bowl, a second cousin to chirashi, was what my daughter ordered. The salmon roe in the dish looked quite appealing. 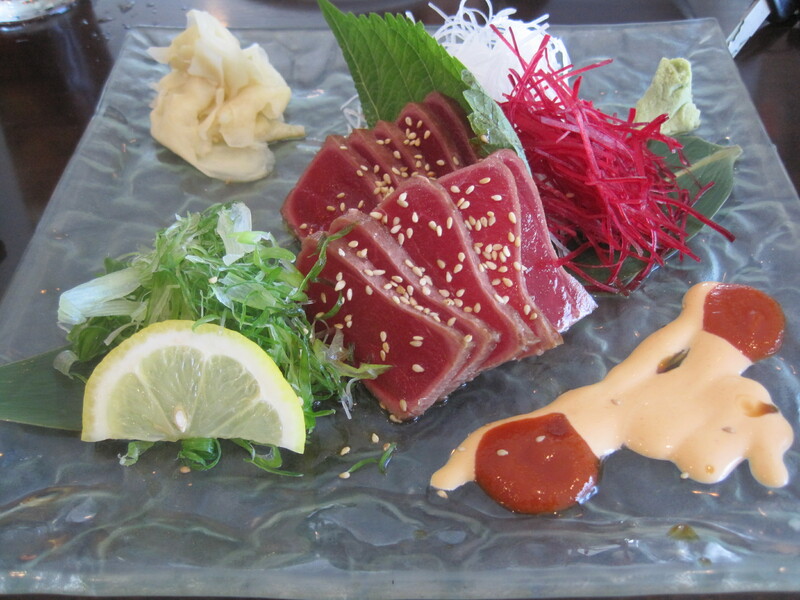 The tuna tataki was a photo op on a plate. 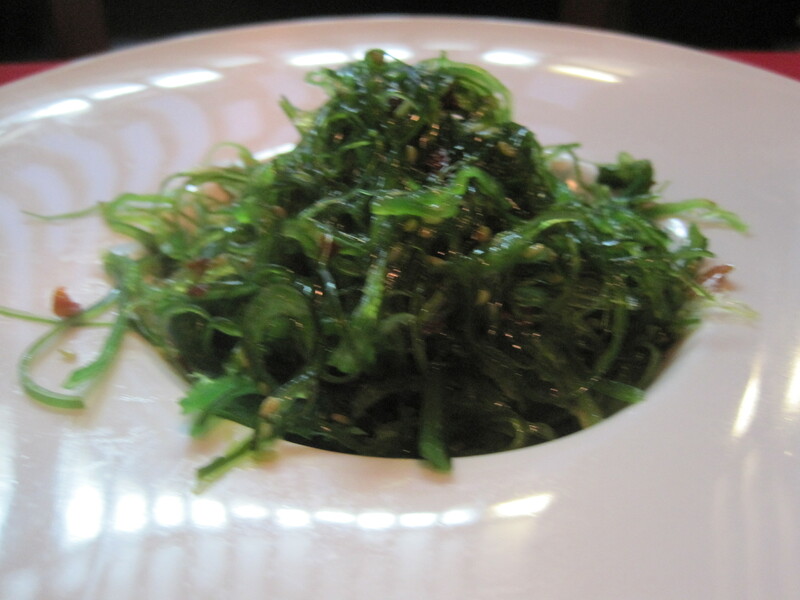 The dishes in Blue Fin present well, and are graceful on the table. We enjoyed the eatery quite a bit. I didn’t see any signs of wildly overpriced food, given the serving sizes involved. Prices here are not cheap, but you get what you pay for. And at Blue Fin, what you get is a quality dining experience. 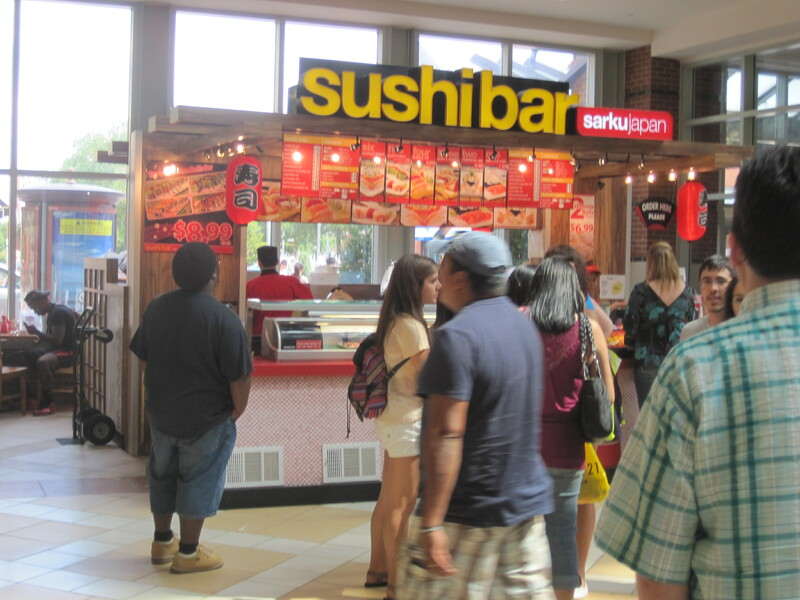 The Sarku Japan booth in the Mall of Georgia is very minimal, and in that, ironically, it is perhaps more Japanese than the oversized metroplex izakaya that so many foodies love. The classic walkway eatery has no place in America, except in our food halls, and even if the Sarku product is modest, it gives us a small taste of the “walk by and grab it” scene. 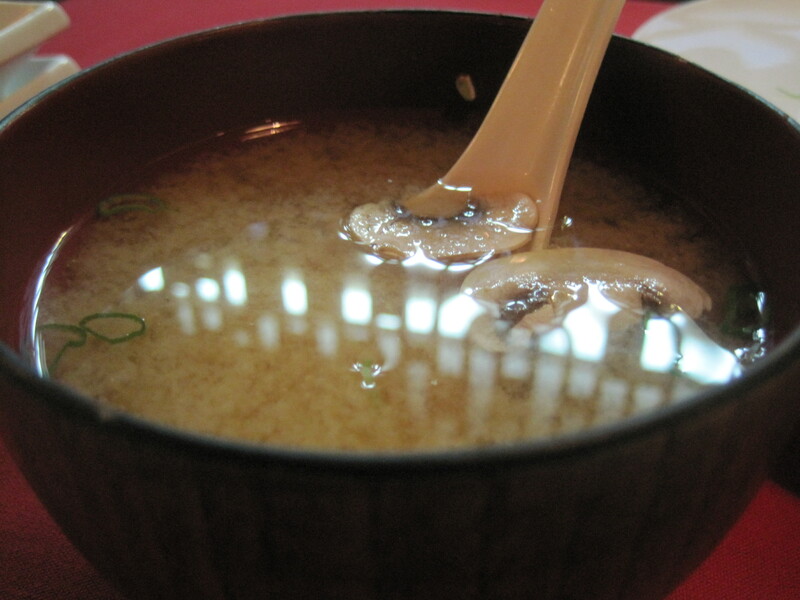 As a minimal restaurant, perhaps more authentic than our more common metroplex izakaya. Are there things to complain about? Sure. I’d have much preferred a small grill oriented izakaya, where I could grab something to drink and a toasty octopus tendril at the same time, but this is food court cuisine, where teryaki chicken morphs into “bourbon” chicken, and everything exists to feed a crowd of thousands as fast as possible. Seldom is the food high end, but it is very often original, as the competition for mouths in a food hall is ruthless. I’m also on record as saying the obsession with sushi in the States is peculiarly American. Americans do things with sushi that its creators never dreamed of, and obsess over it endlessly, as if it’s the beginning and end of Japanese cuisine. It’s akin to judging all Mexican cuisine by the quality of the “Speedy with beans” that they serve. That said, let’s get down to the business of looking closer at Sarku. 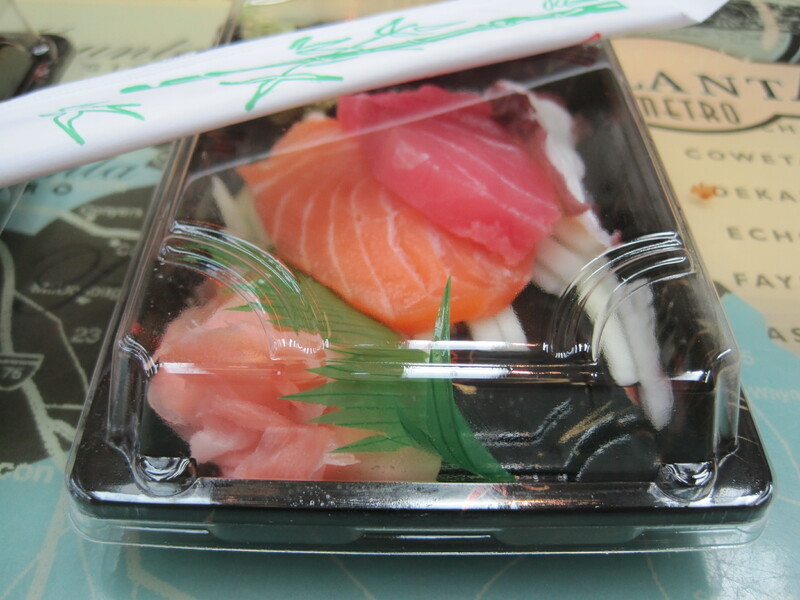 tuna and salmon sashimi, as delivered. Food, when you get it, is ice cold. That long display case in which they show their goods is actually a refrigerator, and given how cold my seaweed salad was, in full working order. One guy mans the cash register, 2-3 others man the case, and build foods for their audience. 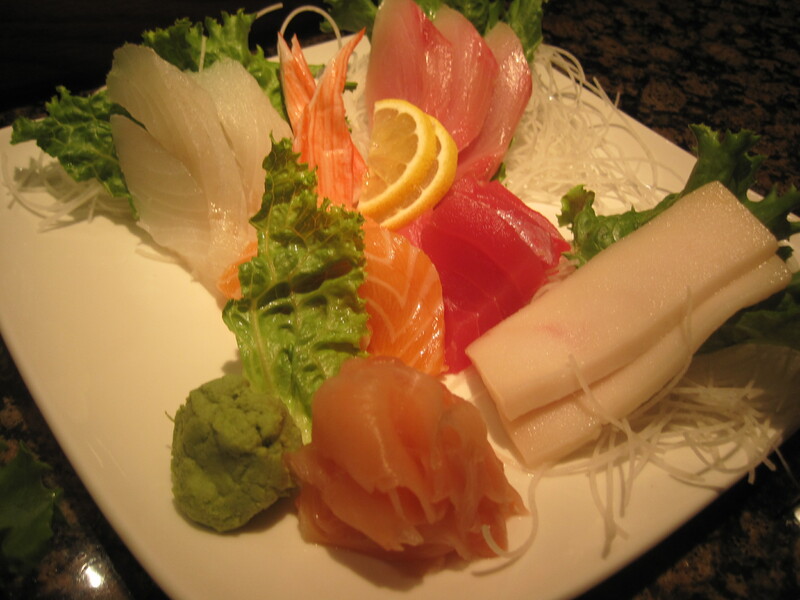 There aren’t many nigiri or sashimi choices, perhaps 5 or 6, and they are pretty straightforward choices at that (tilapia, tuna, salmon, etc). 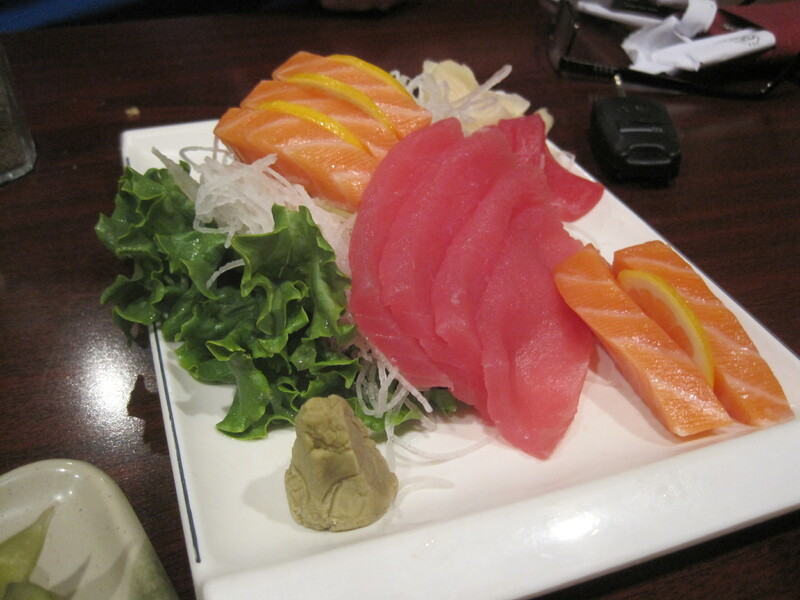 Since I’m a diabetic, I got sashimi rather than sushi. Sarku serves their fish with slices of pickled ginger and a bit of sliced vegetable. I enjoyed the fish, delivered ice cold, and felt it was better than what I could get at, say, Publix, and perhaps not to the quality of what I could get at Waraku or Haru Ichiban. The fish wasn’t as firm, I thought, perhaps not as good a cut. In summary: It’s clean, neat, accessible, geared to fast delivery in a food court environment. Better than grocer’s sushi, but doesn’t reach the quality of a full service Japanese restaurant, much less a high end sushi specialty shop. Recommended for what it is. 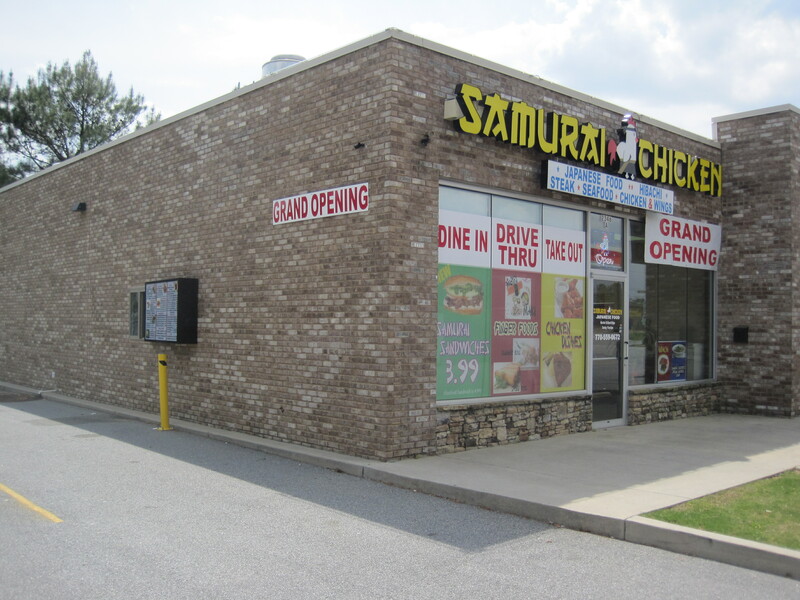 Samurai Chicken is a brightly colored restaurant at the corner of Oakland Road and Lawrenceville Highway, Highway 29, and at first glance it looks like another Japanese influenced eatery oriented towards inexpensive hibachi style meals. This is, of course, a concept that has been tried in Lawrenceville before, with the now-closed Totori Fresh Grill. But a careful perusal of the Samurai Chicken menu shows some interesting quirks, things that push this restaurant up into the “worth discussing” range, perhaps even to the “culinarily interesting” point. 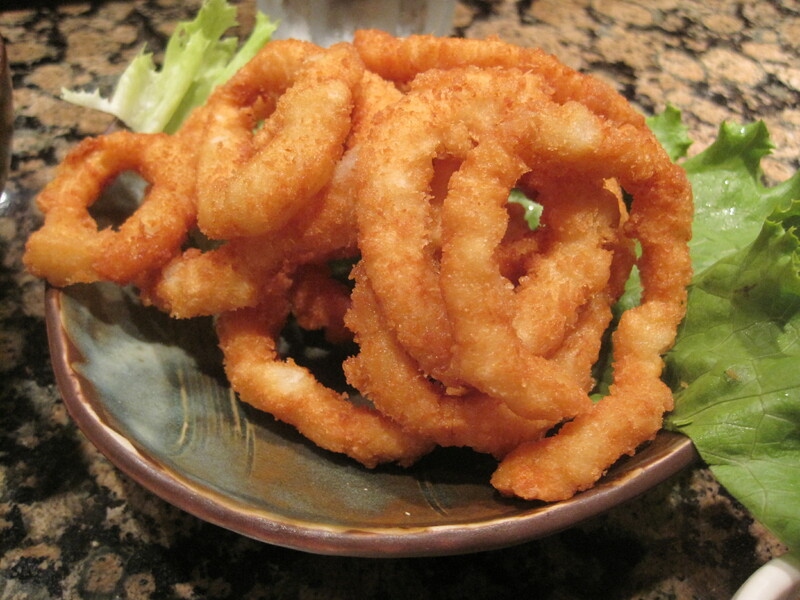 For one, the staff is clearly aware of the Chinese heritage of various Japanese noodle dishes. Their yakisoba is also labeled Lo Mein. For another, if the magazines the staff were reading are any indication, they are fluent in Vietnamese (I asked afterwards; the staffer who spoke with me had both Korean and Vietnamese heritage). That makes Samurai Chicken’s soups and their sandwiches yet another deal entirely, as I don’t recall a single Vietnamese restaurant in Snellville or Lawrenceville. Samurai Sandwich or banh mi? When it looks like a duck.. So, after having had hibachi, I went ahead and ordered their grilled chicken Samurai Sandwich. 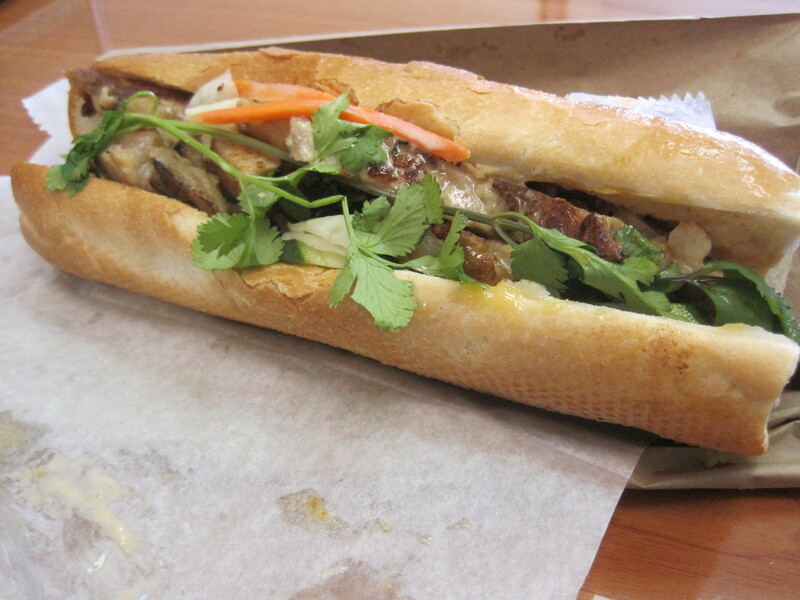 Yep, it has the good banh mi bread. it has the nice banh mi spicing. The sandwich is nicely wrapped, and large, substantially larger than other banh mi I’ve had. In retrospect, maybe more mayo than I would have preferred, but the chicken was nicely done. I haven’t had their pho yet, but I’d be interested in trying it. To note, there is no pork here. The proteins du jour are chicken, steak, fish, and shrimp. Outside of hibachi, sandwiches, pho, they also serve Samurai Wings (buffalo wings), spring rolls, cooked sushi. So, this is an easy place to get a fast meal. But for the Snellville/Lawrenceville foodie, the first appearance of a convenient source of pho or banh mi is of perhaps more interest, as Japanese (i.e. 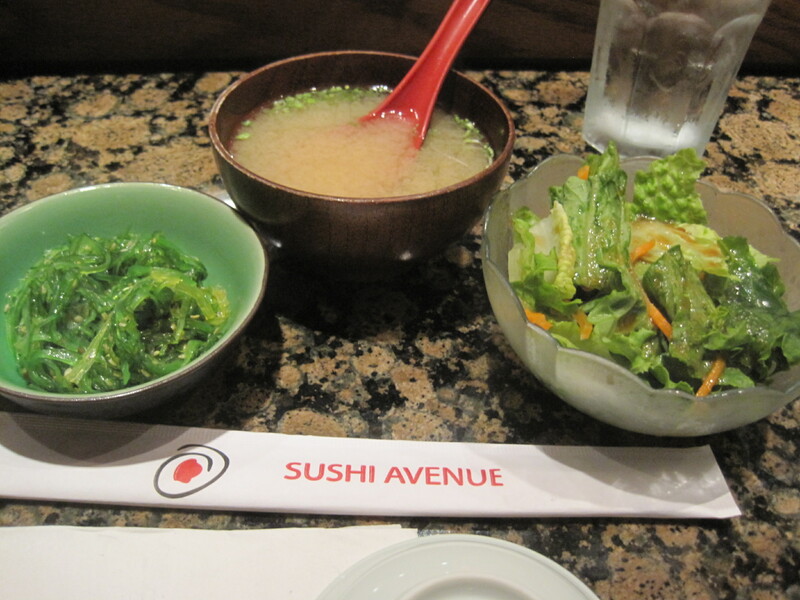 Sushi Avenue, Sushi Gallery, Kanpai) is not hard to come by in these parts. From the Five Forks – Oak Road intersection, the easiest way to get to Samurai Chicken is to head down Oak Road towards Lawrenceville. It will turn into Huff Road after the railroad tracks (if you take the right turn) and Huff will intersect Lawrenceville Highway. Head north one block. Samurai Chicken will be on your right. Otherwise, from Snellville head down Ronald Reagan towards Duluth and exit at Bethesda Church Road. Follow the road until you intersect Lawrenceville Highway. Head north to the intersection of Oakland and Highway 29. 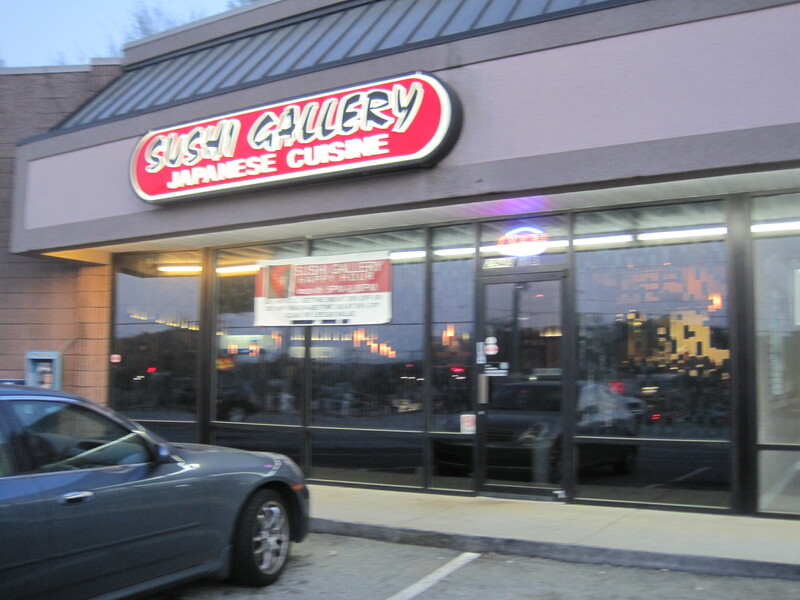 Sushi Gallery is located at the strip mall near the corner of Five Forks Trickum and Dogwood, in the same location as an older dollar sushi place. This location is almost immediately accessible if you exit Ronald Reagan from the Five Forks exit. I’ve been curious about this place, as it is close to where I live, but never had the opportunity to drop by until now. Short version? It’s a good looking restaurant. Further, I was surprised by the quality, the ambience, the care this eatery puts into its food. Staff are dressed in kimono or chef’s apron. The atmosphere is soothing and warm. 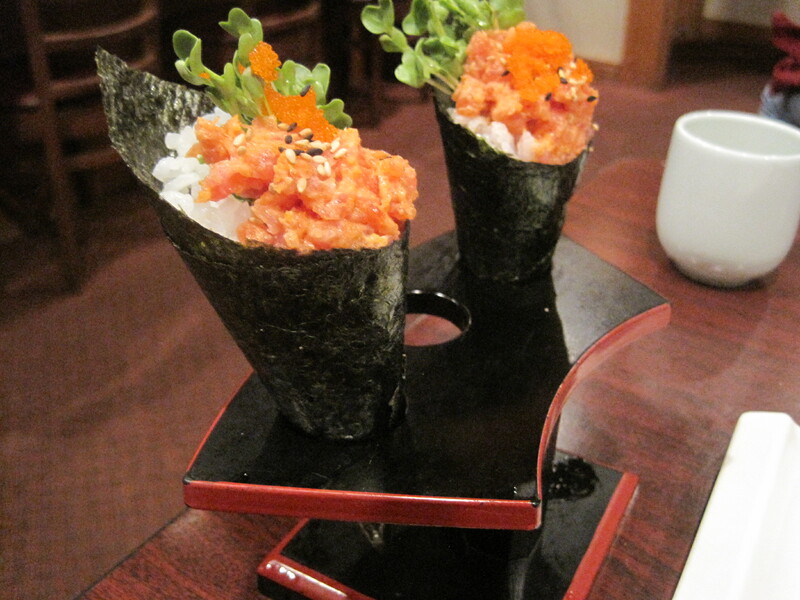 The restaurant is largely a sushi place, though there are some useful small plates. I had the sashimi special. They were good pieces, though not as diverse a collection of fish as one might get in a larger establishment. No matter, I was happy with my selection and thought it good value, given its location. No, it probably won’t make you forget the kinds of places that use Learjets to fly in fresh fish from the coast, but you won’t have to pay Learjet prices for your food either. As a place to take a date to impress, or just a quiet respite for the evening, this place has the goods. Gogi Brothers was mentioned by a reader of my blog some time ago, but life, work changes, and all made it really impossible for me to run around Snellville the way I normally do. My focus was inward, towards the city of Atlanta, not out of it. I never found this restaurant until I made an ill fated run for jerk chicken towards Grayson (I should realize that small, mom and pop Jamaican eateries are invariably closed on Sundays). 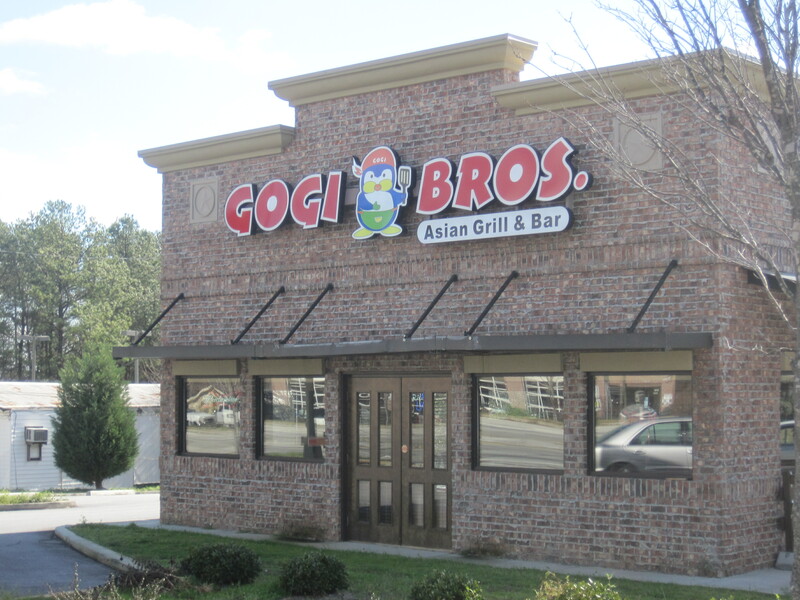 It turns out that Gogi Brothers has occupied a building a stone’s throw from the Mellow Mushroom on Highway 78, and so most Snellville residents can find Gogi simply by heading down 78 towards Loganville. It will be on the right if you do. The building is handsome, a pretty brick, and if my memory serves, the building used to be home to a Dickey’s BBQ in the past. 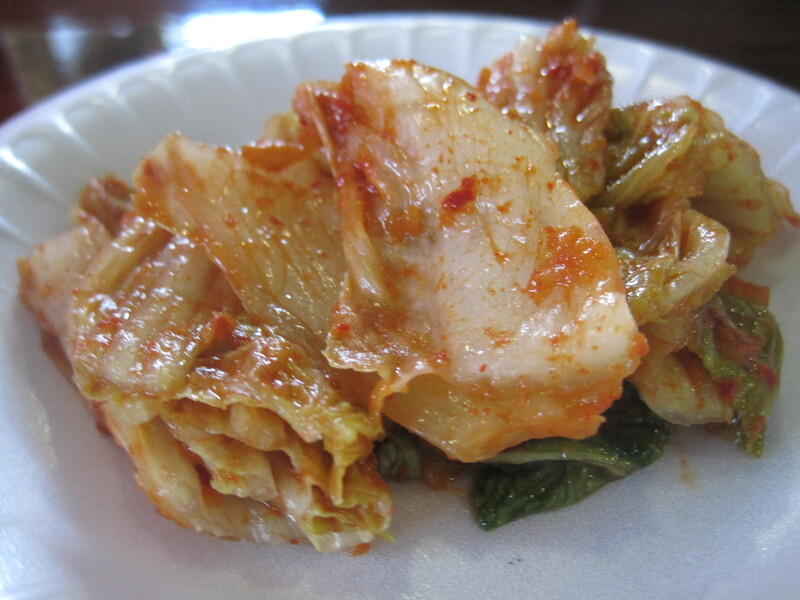 Kimchi as an appetizer. It's not on the menu but you can ask for it. Now, Gogi is the word for “meat” in Korean, and this restaurant doesn’t easily fit into any single category. Instead, it’s a cross cultural assortment of foods that they serve, everything from Korean influenced dishes, Thai dishes, some Japanese dishes (teppenyaki style dishes, mostly), American and American-Korean favorites — what else is a bulgogi burger — and they also push their hot wings. They serve beer and wine, and this place will deliver as well. 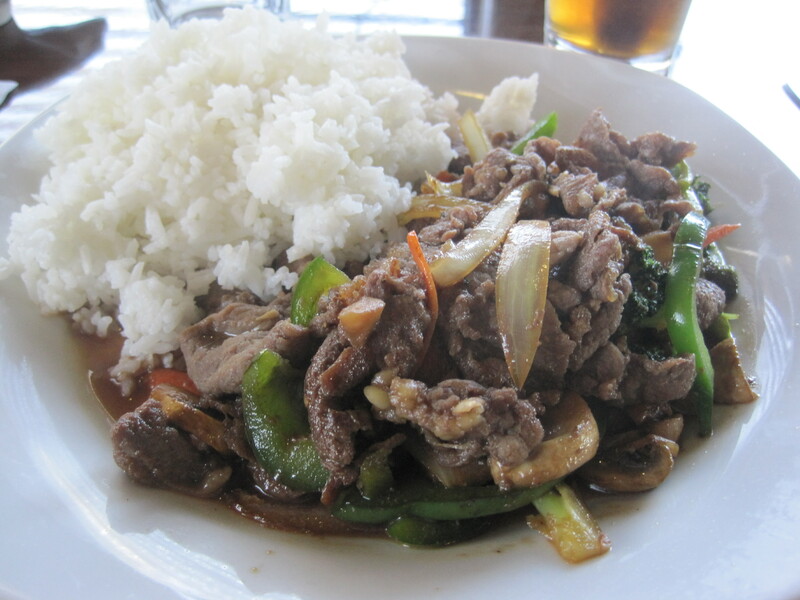 Gogi's babimbap. No stone bowl, and a lot of greens in this version. When you cover this much ground, some things are lost. 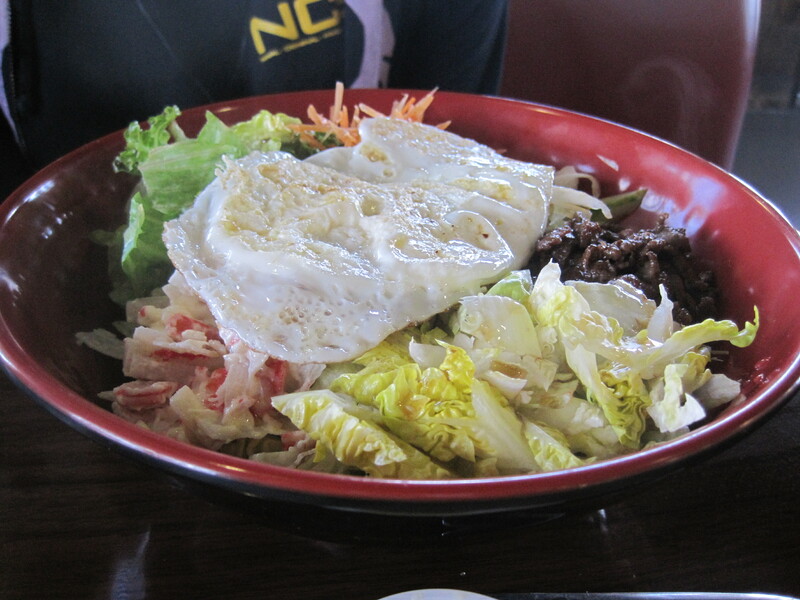 Korean dishes are not served in stone bowls, so the bibimbap here isn’t like what you can find in, say, Assi Plaza. 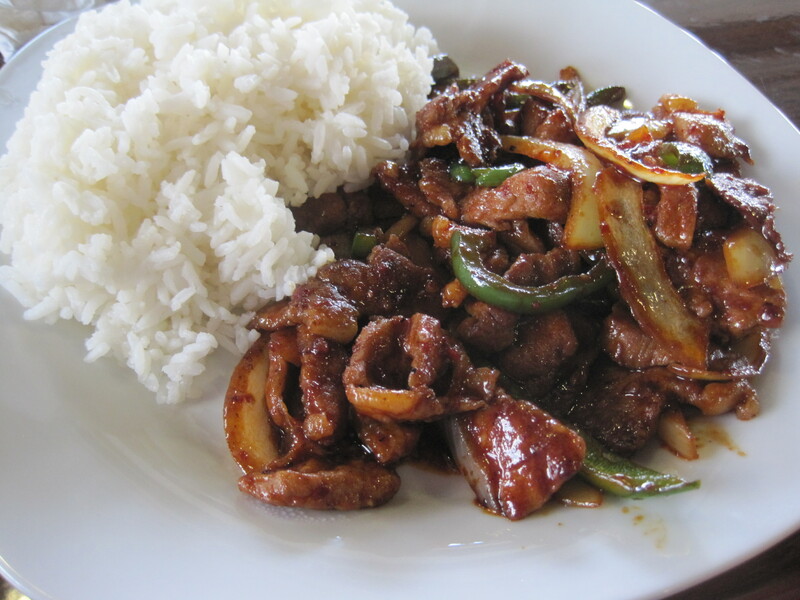 In fact, my favorite Korean dish here goes by the very proletarian name of “spicy pork”. They have “spicy chicken” as well. Staff here is largely Korean, well dressed and mannered, and pretty nice. And what this place loses in authenticity it makes up for in sheer willingness to serve. 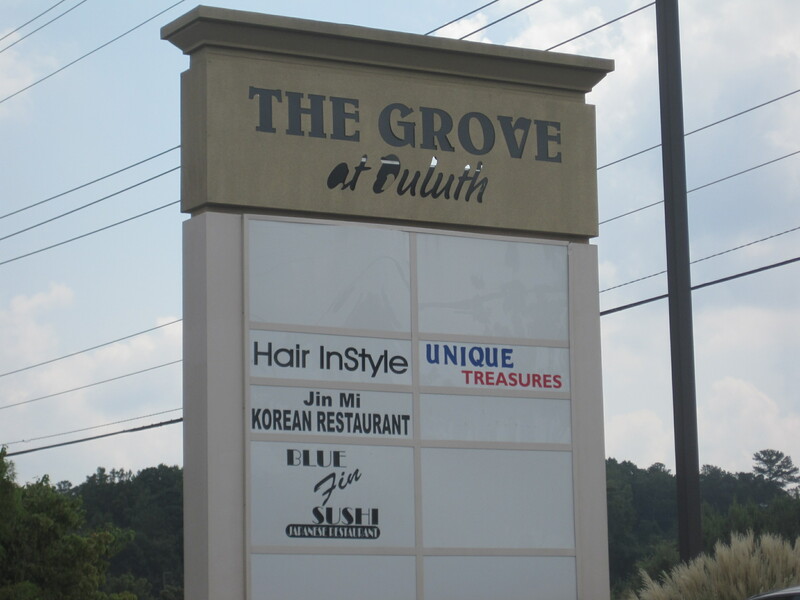 Snellville is better off with this place than without, as Korean is a bold assertive cuisine, and any inroads they can make into our dining habits are probably good ones.